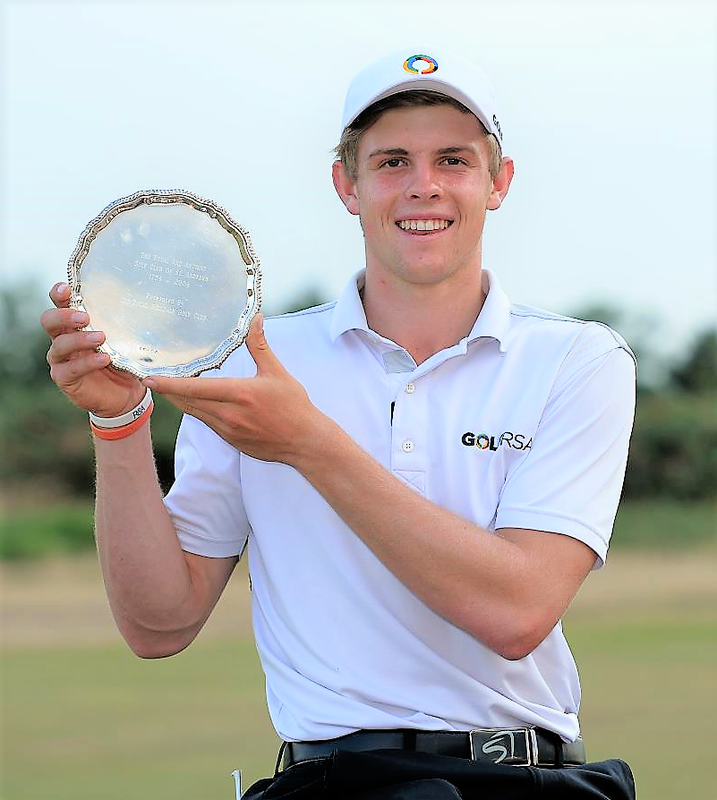 South Africa’s Martin Vorster survived a major scare to claim his first major international title in The Junior Open over the Eden course at St Andrews. The 16-year-old member of the Louis Oosthuizen Academy was five shots clear of the field after opening rounds of 66 and 65 but after a solid start to his final round he found sand off the tee on the 346-yard par-4 7th on his way to running up a triple bogey seven. The South African’s lead was suddenly cut to two but he showed composure beyond his years by hitting his tee shot on the 178-yard par-3 8th to eight feet and then playing the next ten holes in one-over-par to post a four-over-par 74 and become the first South African to win the championship. “That was a nervous moment,” he admitted. “I made a very stupid triple bogey but I told myself I was still in the lead and to forget about it and focus on the next shot. Fortunately, it turned out to be a good one, although I did miss the putt. “This win means a lot to me and especially because I came in here having finished second in my last two starts. I was beginning to wonder if I would ever make the breakthrough so I admit I’m a bit emotional at the moment. Vorster’s win came just a few weeks after his compatriot Jovan Rebula won The Amateur Championship at Royal Aberdeen and he went on to thank Rebula for his contribution towards his victory. “He watched me play the last few holes of the Dimension tournament and then came over to speak to me after I lost. “He is a big role model for me. I really look up to him so when he came up and told me I was a great golfer that really meant a lot. He told me to stay patient and the win would definitely come. “That was the key this week. I tried to stay patient even when things weren’t going well and I think that contributed to my success. Vorster’s closing 74 saw him finish on five-under-par 205 and one shot ahead of 14-year-old Japanese girl Tsubasa Kajitani, who in front of a large crowd birdied two of her last three holes to card a level par 70. New Zealand’s Jayden Ford played his last 12 holes in four-under-par to card a final round 68 and finish third on three-under-par 206 and his performance was all the more impressive because he lost his clubs in transit from London and had to play his opening round with borrowed clubs. “It wasn’t ideal but that’s just the way it is,” he said. “I managed to score 69 so I can’t complain too much. Further down the leaderboard Gordan Brixi from the Czech Republic closed with a six-under-par 64 and his low round of the tournament was enough to see him move up to fourth place on two-under- par 208. World No. 12 Atthiya Thitikul from Thailand also played her best golf of the championship in a two-under-par 68 which moved her up into a share of fifth place with Argentina’s Abel Gallegos on 209 while Australia’s Thomas Heaton posted a level par 70 to finish seventh one shot further behind.